If you're looking for new living room furniture, Weekends Only Furniture & Mattress recommends considering the layout of your great room and the style of your home before making any purchases. 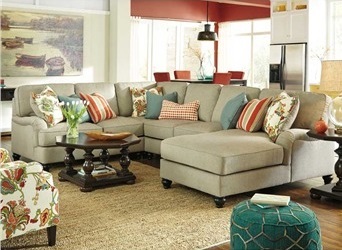 By visiting one of their 50,000-square-foot stores in the St. Louis, Missouri, and Indianapolis, Indiana, areas, you can peruse their collection and find the perfect living room set based on your budget and needs. Even though you might want to buy the first cute sofa or loveseat you see, it's a good idea to size up your living area and figure out how much space you have to work with. After taking measurements and writing them down, come into Weekends Only and piece together a living room set that fits snugly into your family room. When you’re purchasing living room furniture, the next question you should ask yourself is, "What look am I going for?" Whether you want to replace your outdated sofa with a sectional or deck out the great room with a large dining table or home entertainment system, deciding if you want a traditional, contemporary, modern, or rustic look will help you narrow down your options. For sofas, consider getting neutral beige, cream, or gray if you have splashes of color in other areas of the room. If you're getting a coffee table, choose from options like a versatile walnut finish to match your other decor. Your home decor shouldn’t feel too busy with mismatched colors and patterns, so concentrate on creating a few focal points—like a vibrant throw pillow, patterned rug, or statement piece of wall art—and then stick to the same color palette for the rest of your design. If the rest of your living room is more subdued, you can punch up the room with a statement piece like a jewel-toned sofa or sectional. For help finding the best living room furniture in St Louis, contact Weekends Only Furniture & Mattress by calling (855) 803-5888. You can also visit them online for further details about their selection. Weekends Only Furniture & Mattress offers a shopping experience unlike any other. New inventory is added every week, and the store is only open Friday through Sunday, which allows them to lower overhead costs and offer rock-bottom prices. To see their latest stock of living room furniture, visit one of their stores in Indiana (Castleton) or in Missouri (Fairview Heights, St. Peters, South County, Manchester, and Bridgeton) this weekend!